1. First, you'll want to cut up some watermelon and freeze it. You can start with room temperature watermleon but the color stays more even if you freeze it first. 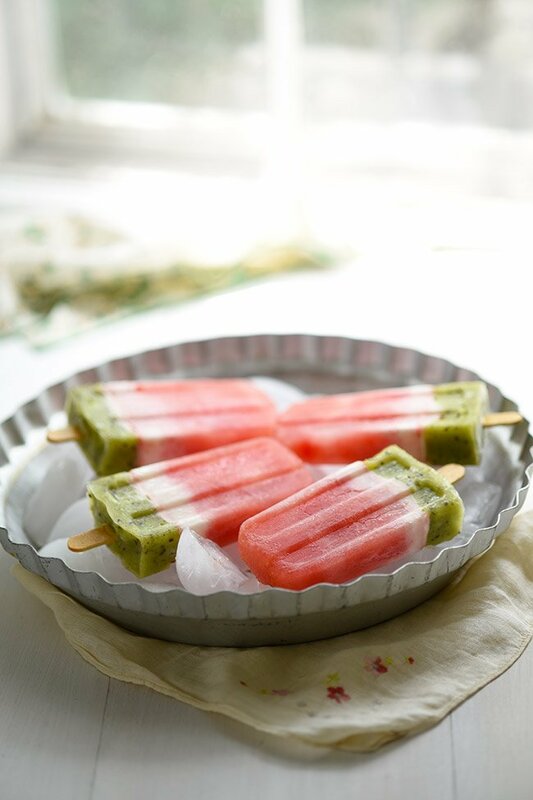 So puree the frozen watermelon using a blender then spoon into the popscile molds fill each up and 3/4 full. 3. 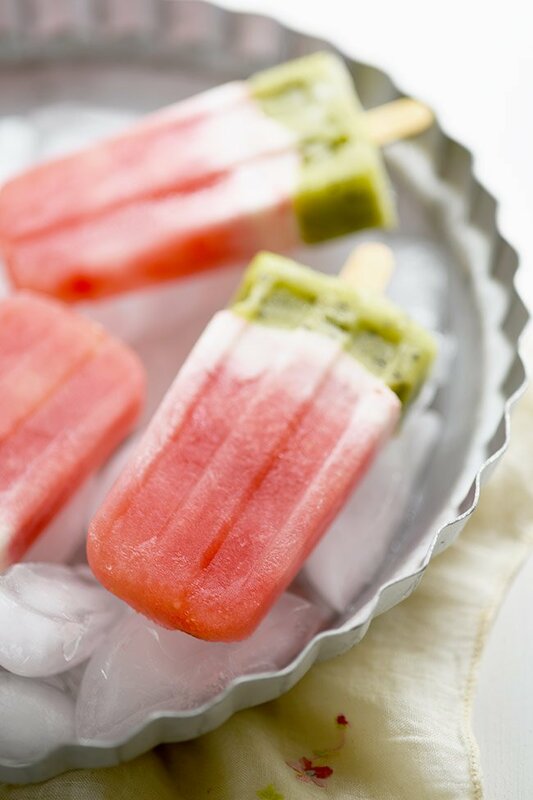 Remove from freezer and add a tbsp of Greek yogurt to each popsicle. You may need to press the yogurt into the mold to eliminate air pockets. 4. Freeze for another 30 minutes. 5. Finally, puree the kiwi in a blender and layer that on top of the frozen yogurt. Freeze for at least an hour. 6. To serve, run the popsicle container under warm water to loosen from mold. Enjoy! What’s a good way to use up leftover watermel? You’re looking at it! 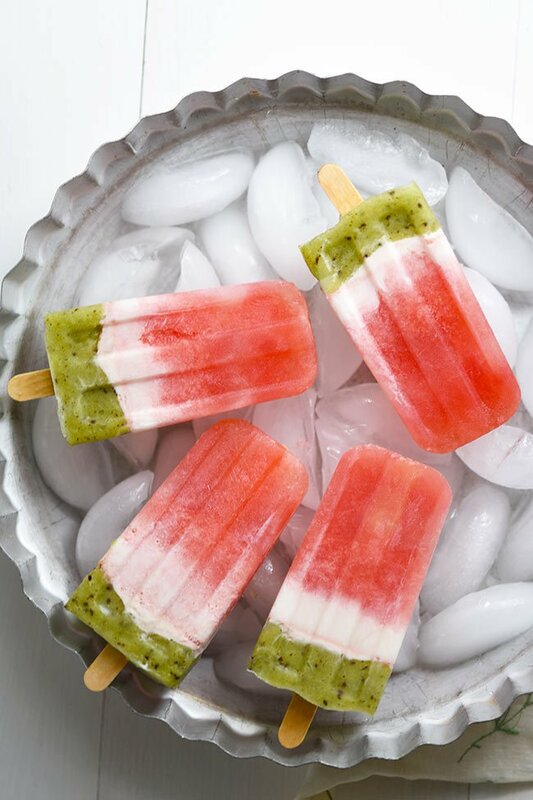 These watermelon popsicles. Is it just me or do you always have leftover watermelon? I mean, the things are just huge. That’s totally their charm but I am crazy about not wasting food so I’m always looking for new ways to use up our leftover watermelon in the summer. You may remember my watermelon-lime slushies from last year. 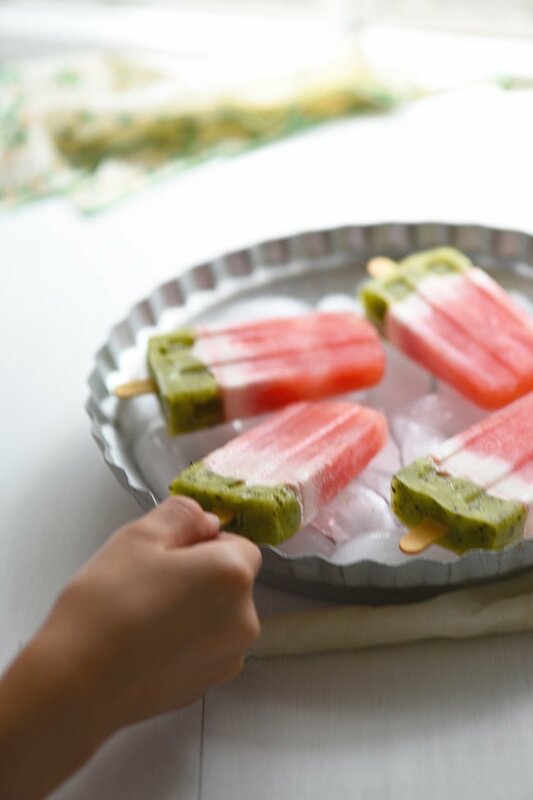 Now this year we’re stepping things up a bit with these homemade watermelon popsicles! They look like watermelon and they are actually made out of watermelon. But they’re popsicles. Kids think this is just so funny. I’m giggling too because they’re finally eating something healthy and they either don’t realize or they don’t care. Woo hoo! So yeah, these are fun and really easy to make. You can use any ingredients you want but I chose watermelon, half and half and kiwi. Next time I think I’ll use vanilla Greek yogurt instead of half and half because the half and half got a little runny and messed with the look of them a little. The taste was good though, kind of like a creamsicle. I think yogurt would serve that same purpose though. So that’s how I’m writing up the recipe below. Feel free to choose your own ingredients and experiment! You can also add in chocolate chips for the “seeds” if you’d like. I choose not too because I wasn’t sure how chocolate would mix with watermelon but my kids had the idea to add them in so next time I’ll give it a try.